This year’s BIA Parade of Homes features nine homes built by Central Ohio builders priced in the $600,000 range. Builders are working hard to finish the interiors and landscaping in time for the Sept. 2-17 show. Builders are working hard to meet the Sept. 2 deadline for the Building Industry Association of Central Ohio 2017 Parade of Homes at Cheshire Woods. It’s Delaware County’s third straight year to host the parade. This year’s event features nine homes built by Central Ohio builders priced in the $600,000 range. Weirick said there could be three generations living in one home with children staying longer and parents moving into their children’s home. Manor Homes was this year’s recipient of BIA Parade Foundation Home. Jeff Yates of Manor Homes said the home is a five-level structure with an open-concept floor plan. The design incorporates reclaimed wood fixtures to add the texture and warmth of rough cut wood. The posts supporting the upstairs balcony, the ceiling of the master bath and a wall in the front entrance all feature the reclaimed wood. Reclamation seemed to be an underlying theme in the homes. Rob Little, Westport Homes sales manager, said his company doesn’t bulldoze development properties with barns any longer. Little said many of the Westport Homes have the Amish furniture made from from disassembled barns on display. Westport’s home is a ranch with a large open floor plan featuring the ultimate man cave in the basement. “Clients are asking for less dividing walls and more openness,” Little said. Wood isn’t the only thing being reclaimed and finding new life in this year’s Parade of Homes. The Silvestri Group’s home features one of a kind, custom lighting fixtures designed from reclaimed scrap steel and other materials. Local designer Jenny Jehnzen of Ms. Two J’s and Co. Customized Rustic Decor created many of the fixtures in the Silvestri Group’s home. Jehnzen said she frequents flea markets for materials and ideas for her one-off creations. 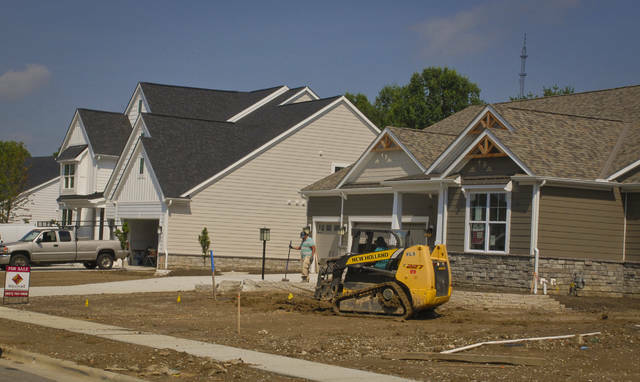 Parade of Homes is open Sept. 2-17 at Cheshire Woods in Delaware County. Parade hours are 11 a.m. to 5 p.m. Sunday and 11 a.m. to 7 p.m. Monday through Saturday. Tickets are $15 at the door. Advance discount tickets are available online for $13. Children 12 and under are admitted free. Parking costs $5 per car. The Parade is sponsored by AEP Ohio, America’s Floor Source, Columbia Gas of Ohio, EverDry Waterproofing, First Federal Lending, and LP SmartSide. This entry was tagged Berkshire, BIA, Cheshire, delaware county. Bookmark the permalink.